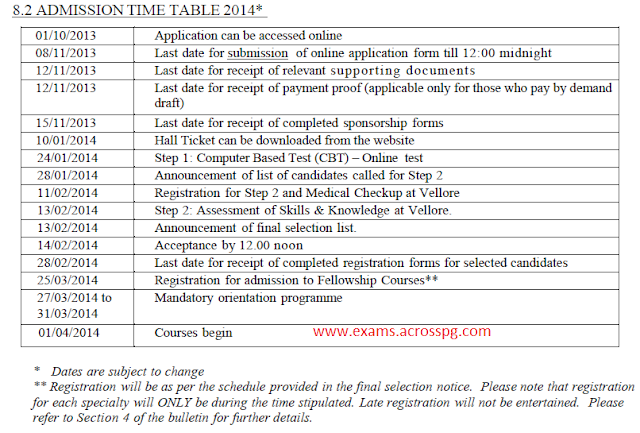 CMC Vellore POST GRADUATE FELLOWSHIP ADMISSIONS February 2014 - AcrossPG Exams! This bulletin may be downloaded free from the website. It gives essential details to candidates and helps them in their application for the various Post Graduate Fellowship courses beginning February 2014. PLEASE GO THROUGH THIS CAREFULLY BEFORE FILLING THE APPLICATION FORM. Application forms can be accessed only on-line through the CMC website, http://admissions.cmcvellore.ac.in/ from 1/10/2013 till 8/11/2013 and submitted online with a basic administrative fee of Rs.1000/-. Candidates applying from SAARC countries should send Rs.2000/- or its equivalent and those from other foreign countries US dollars 100 or its equivalent.